Once again we are getting bombarded with snow here in Philadelphia. This seems to happen every year lately. Hard to believe that Junebug and I have been minding the booth for 12 years! What a gift. It’s so lovely seeing old friends and making new ones. I have the BEST customers. I thought it would be fun to share some photos from the show for those of you who weren’t able to come or would like to know what it is about! 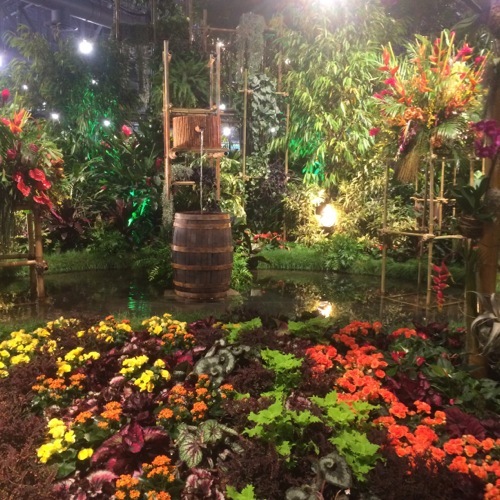 The main entrance garden was alive with color and sounds from the Rainforest. 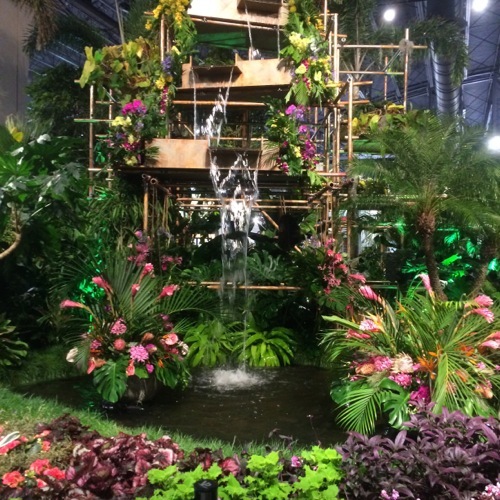 Orchids and tropical flowers took the main stage with bamboo structures and numerous sources of water- including ponds, waterfalls, fountains and rain barrels. 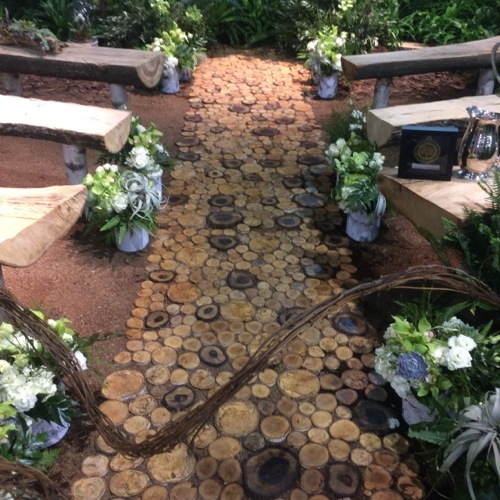 One of my favorite displays was a wooded garden setting for a wedding. It was just lovely and magical!! 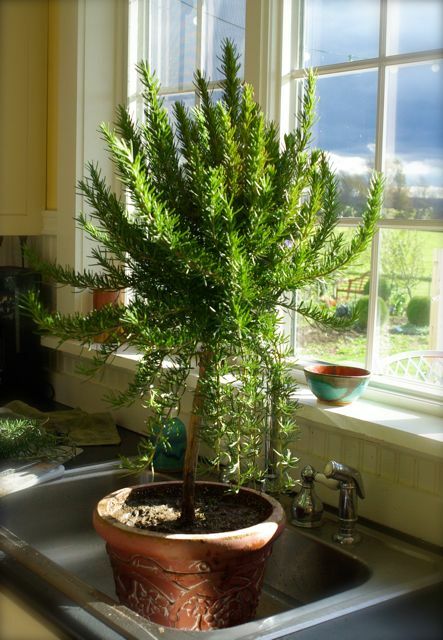 After selling topiaries at my shows for a number of years I’ve learned something… people are nervous about purchasing Rosemary plants for indoor use. And I’ve also learned… there is no reason to be! 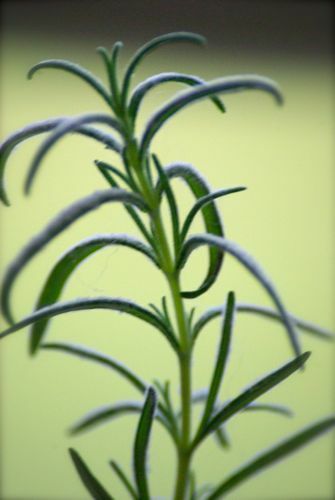 With a south facing exposure and a little attention you can have fresh rosemary on your windowsill all year long even in colder growing zones. I kid you not. It’s -12 wind chill here today. Eegads. Shown above is one of a pair of rosemary standards that I brought home after the Devon Horse Show in May of 2013. The pair spent the summer planted in the potager providing garden structure as well as culinary deliciousness. This photo was taken soon after they were dug and potted up to bring indoors for the winter. 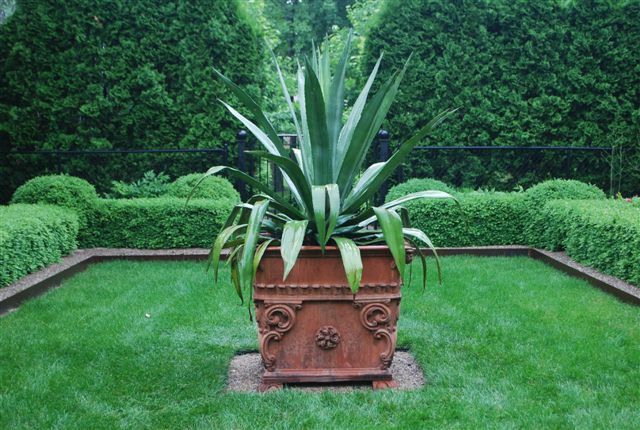 I would recommend polyfoam or ceramic containers… terra cotta drys out much too quickly in a heated environment. I LOVE the shape of these filled-out standards! They are gorgeous on either side of the fireplace. Generally they are kept in a south facing window with lots of natural light. So, after some trial and error and a little “dried” rosemary over the years- here is my secret to overwintering Rosemary topiary. I know, right!? Wait to water them until their new growth starts to show signs of wilting. They are a Mediterranean herb and the soil will need to dry out but they WILL give you a sign of when to water. 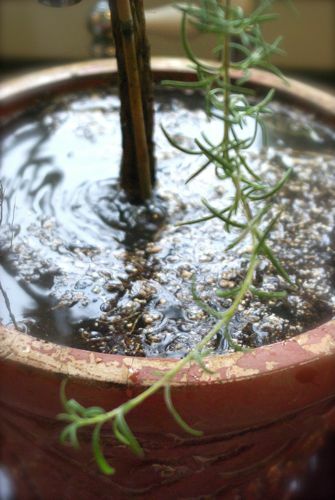 When you perceive the new growth start to droop take them and soak them with WARM water. 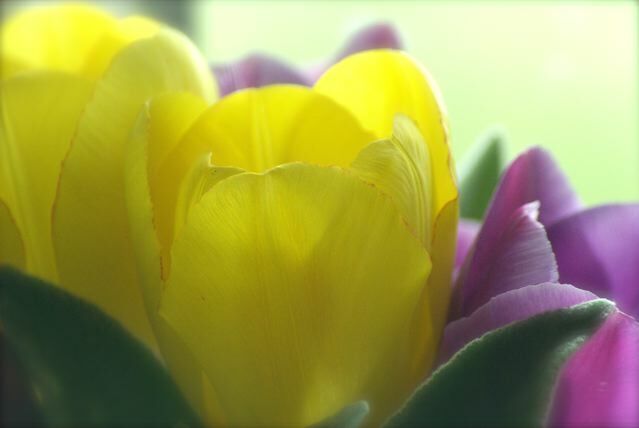 They need to be watered deeply, twice, drained and then given full sun. I will admit- Rosemary is not terribly forgiving and you DO have to pay attention to them. But it is so worth it. The only time that I have ever killed (gasp!) a plant (I think) was when I put it in a place that I was not constantly buzzing in and out of. They all tell you when they are ready to be watered. RIP my sweet bonzi ficus- though you looked so Zen by the bath tub I could not support your daily watering needs. If only you could have fit on the window sill in the kitchen- because we all know those dishes are a never-ending daily nirvana. Do you have a south facing window in a place that you frequent? A perfect place for a Rosemary topiary! Looking for a yummy recipe to put those trimmings to use? Look no further! Tuscan Herb Seasoning one of my FAVORITE ways to use fresh Rosemary- perfect for meats and soups. 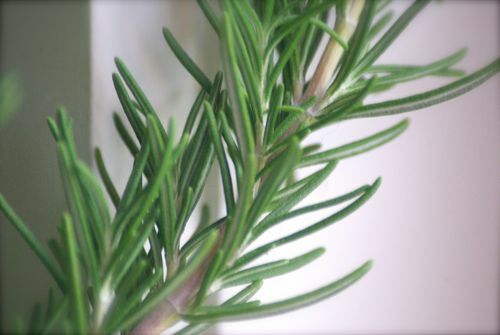 Do you have a favorite recipe that includes fresh Rosemary? Please share! 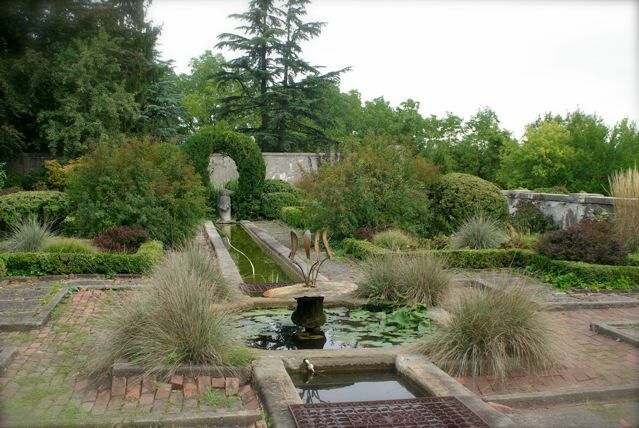 Linwood Gardens were created by William Henry Gratwick II from Buffalo, New York as a country home in the years between 1901 and 1910. 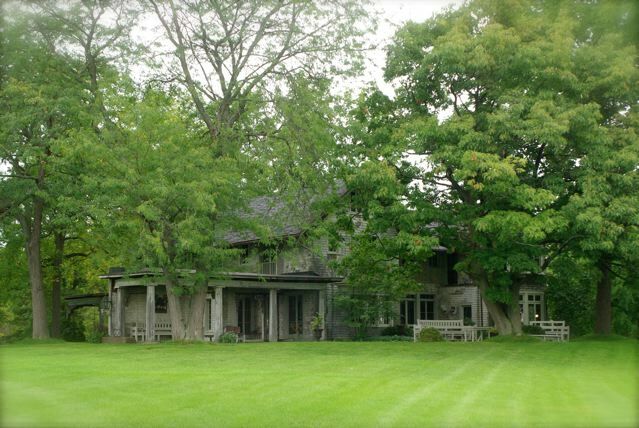 Architect Thomas Fox designed portions of the craftman style Big House and all of the original garden areas. 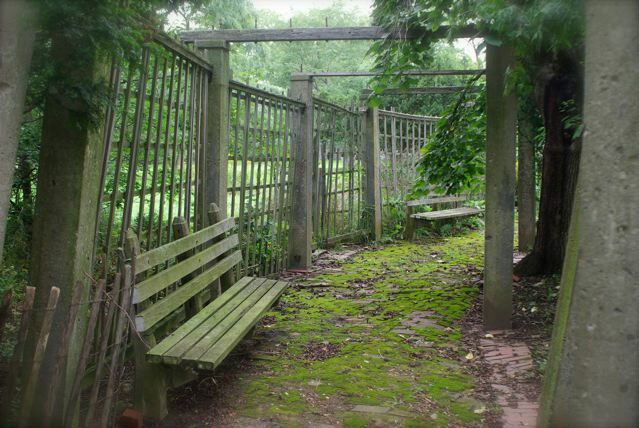 In 1933, William H. Gratwick III moved to Linwood with his family and set up the Rare Plants Nursery. The Japanese Tree Peony became a feature of the nursery and the gardens. 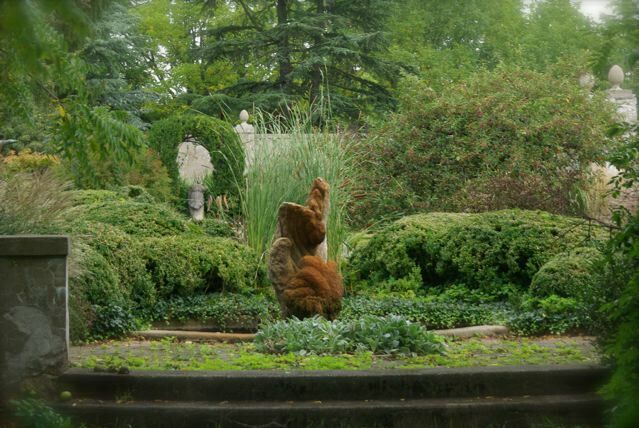 As an artist, landscape architect and horticulturist, WHG III contributed sculpture and new garden areas to the Linwood landscape. His wife, Harriet Gratwick, directed a community music school on the property from 1946-1963. 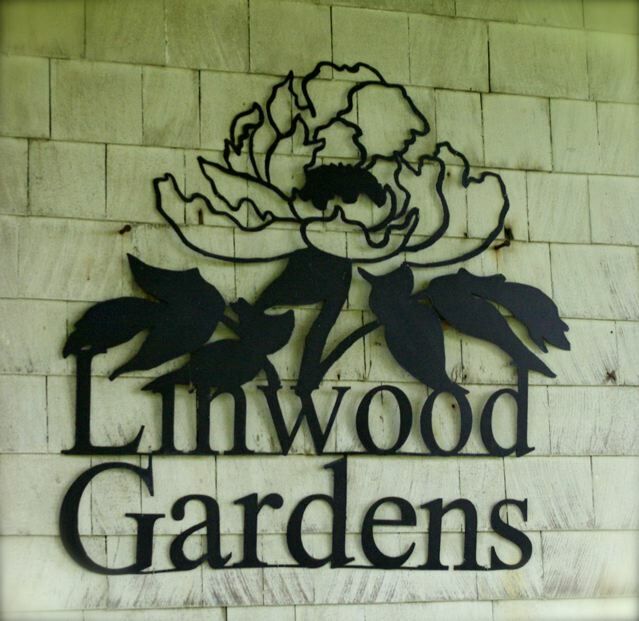 Linwood also hosted a wide variety of cultural activities during those years. The Craftsman style Big House. The interior spaces are sparse with wide wood floors, large mouldings, a beautiful fireplace and craftsman style furniture- simple, weighty and honest. 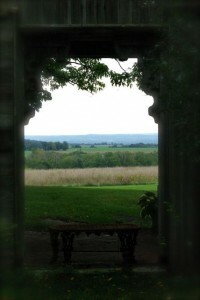 The view from the house looking through the side portico. 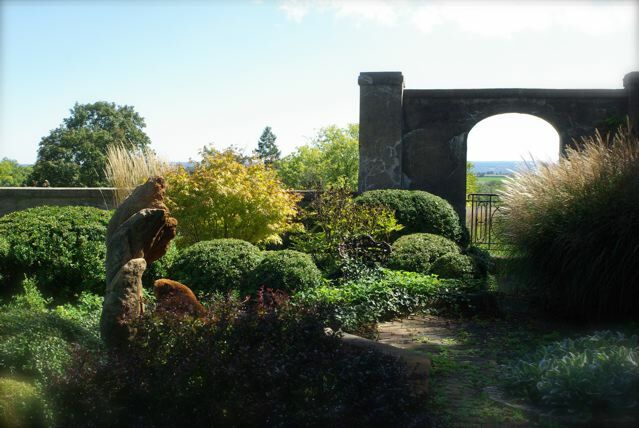 The Italian Garden with a stone sculpture by WHG III. The arbor next to the swimming pool. 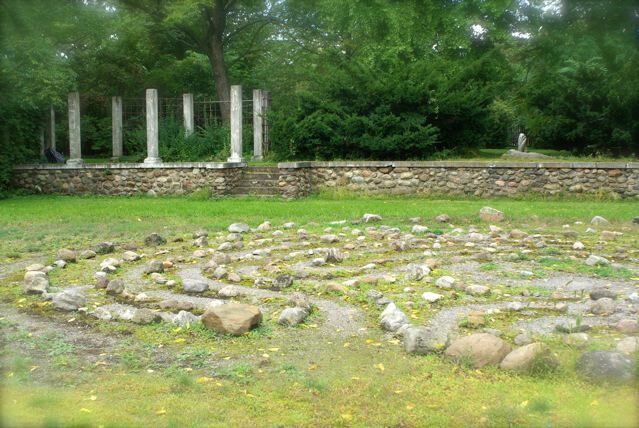 The stone Labyrinth on the grounds of the old tennis court. 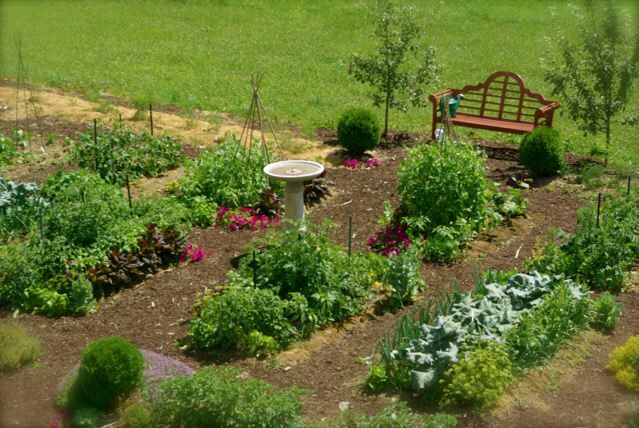 The Perennial and Vegetable Gardens. 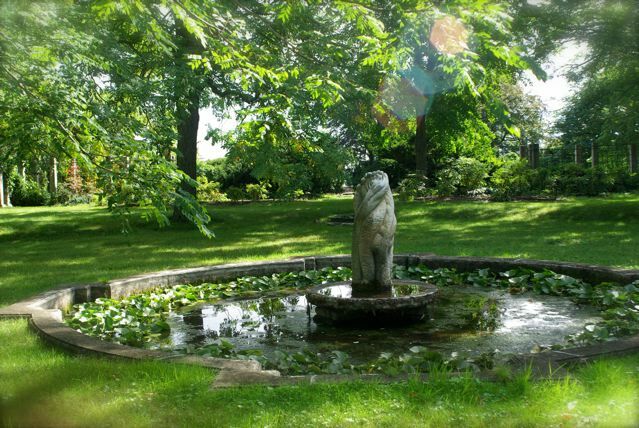 The Lily Pool with a sculpture by WHG III of a tree peony blossom. 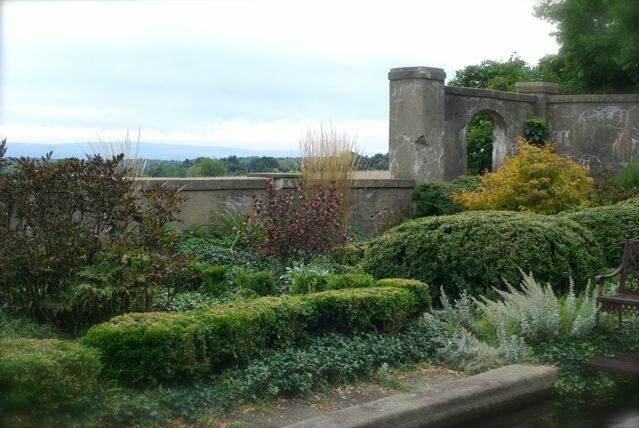 The view from the Italian Garden. 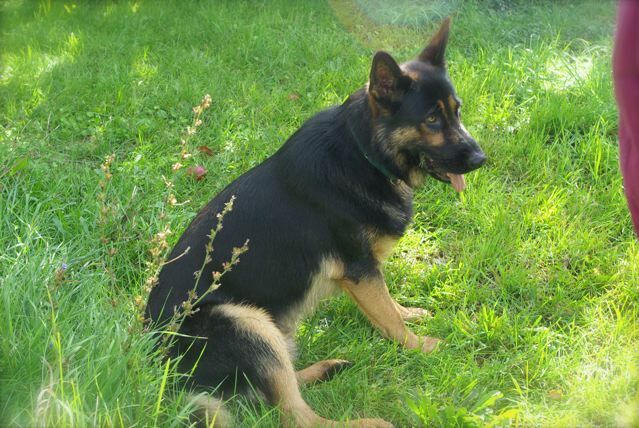 And… last but not least Oscar, the energetic people greeter. 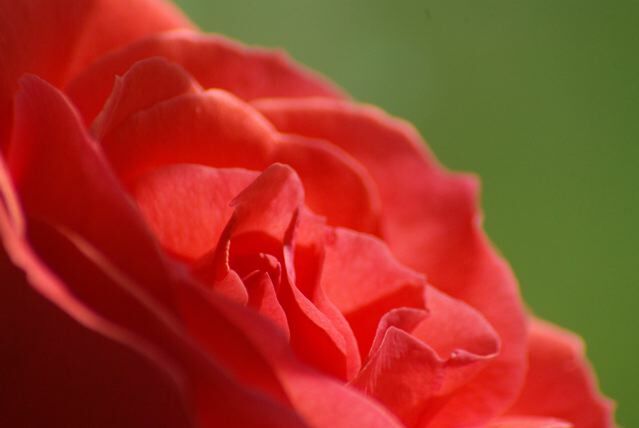 For more information on the Tree Peony Festival of Flowers and Linwood Gardens click Here. One of my favorite climbing roses. I planted this many years ago on the Fourth of July and it never disappoints. 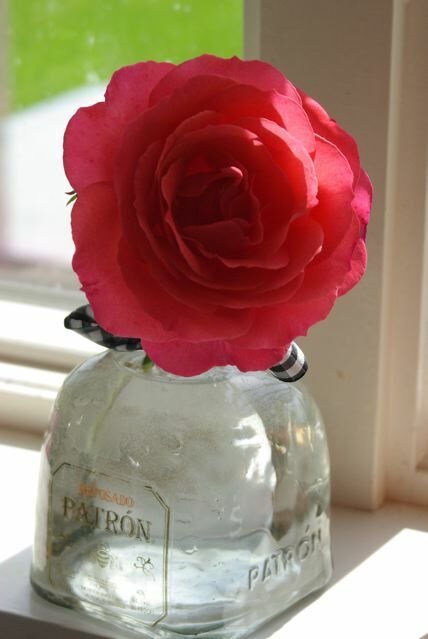 The last bloom of the season I had to cut and bring in to enjoy on the window sill. : ) What is your favorite climber? The view from the studio. My how fast the summer is going… I can’t keep up. The potager is growing nicely this season although I have been rather inconsistent regarding watering. I can’t believe how parched the ground is. Let’s hear it for the sprinkler! 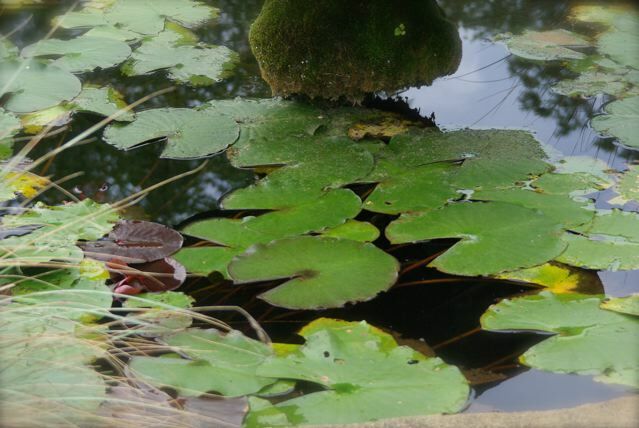 I live on the gardening edge and water from ABOVE… gasp! Please don’t notify the gardening police, thank you. 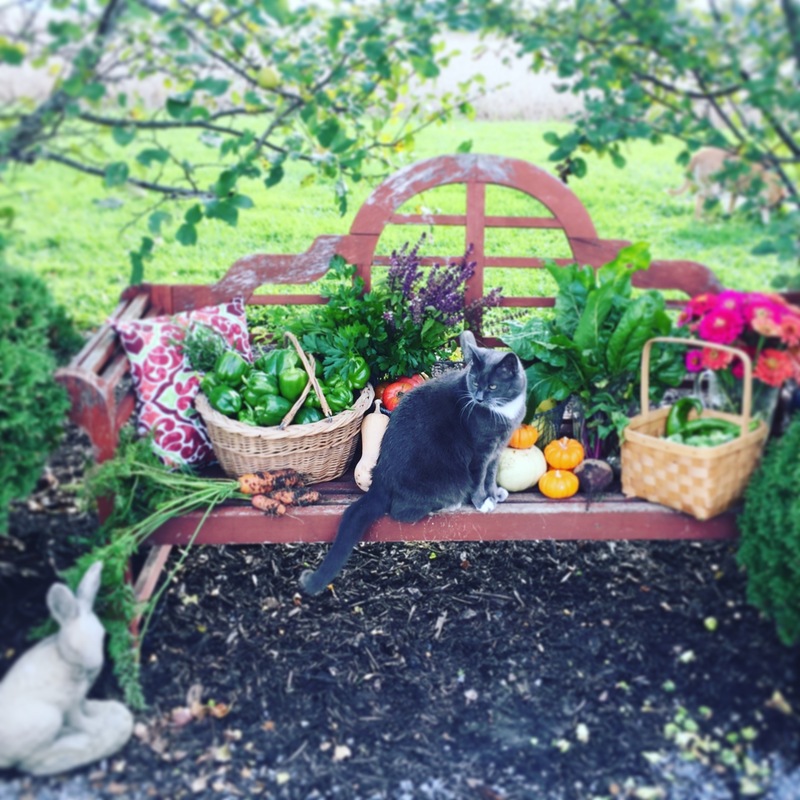 I made a few planting changes this year. The entire back row of the design has been planted to asparagus and I’m looking forward to having a perennial section that will not need replanting next year. Thankfully this family loves fresh asparagus and I must admit that growing up I had never seen fresh asparagus. My only memories of the vegetable were once a year on Christmas Eve- a mushy, smelly substance out of a Campbell’s soup can. Eegads. Imagine my delight at lightly seasoned blanched stems with lemon and butter. Ahhh. Today I had our first tomato of the season in a tomato and basil sandwich. I should have photographed it… but I ate it instead. I believe the variety is Crimson Cushion. Delicious. Nice color, low acid and velvet-y flesh. Hey, I did photograph it with today’s harvest! Broccoli anyone? 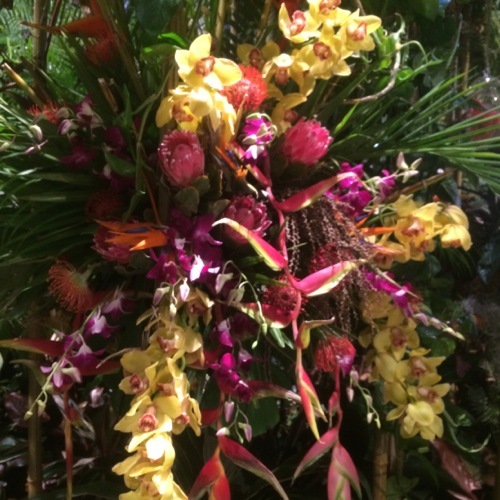 I think this post will get me over the blogging block that I have been experiencing. 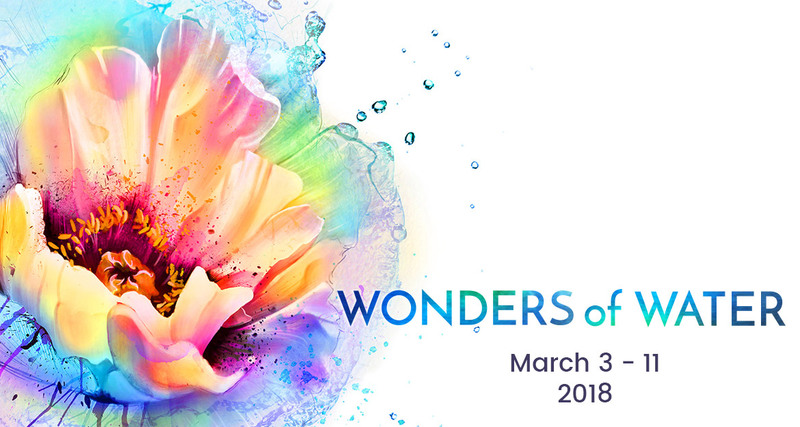 So much to see, do, paint, plant, cook and draw its hard to stay focused. Needless to say- lots to blog about- so come back, pour a glass of wine or iced tea and stay awhile with me and Toonces. Tell us what has been keeping you busy this summer! Toonces doing his best to look sophisticated. Summer is ramping up… and I’m already worn out. May was a whirlwind of activity. Will one of you sweethearts remind me of this next year? 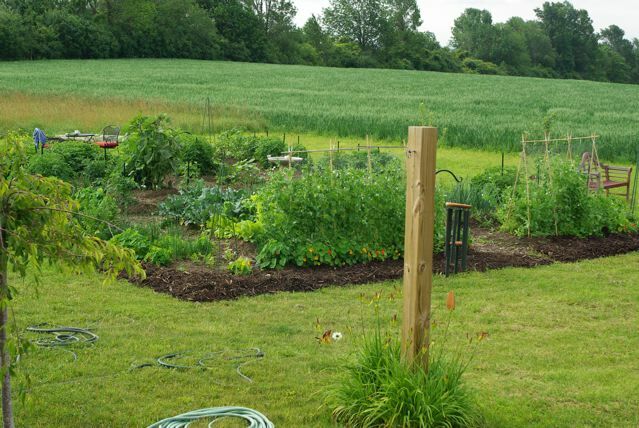 All of those snow-filled days last winter amounted to one very pent up gardener who was ready to dig up the entire yard this Spring just to enjoy being warm, outside and being active. I now understand why Farmboy loves the winter so much. It represents rest. 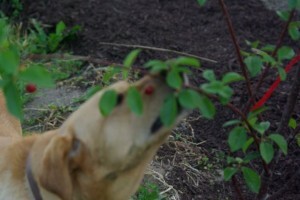 As soon as the soil wakes in the Spring the rush for planting begins. The crops getting in are the biggest priority for the month of May. Farmboy comes in from his IT job, changes clothes, grabs and bite to eat and then heads out. Numerous nights during the month we would meet in bed at midnight- exhausted from deadlines, orders and planting. 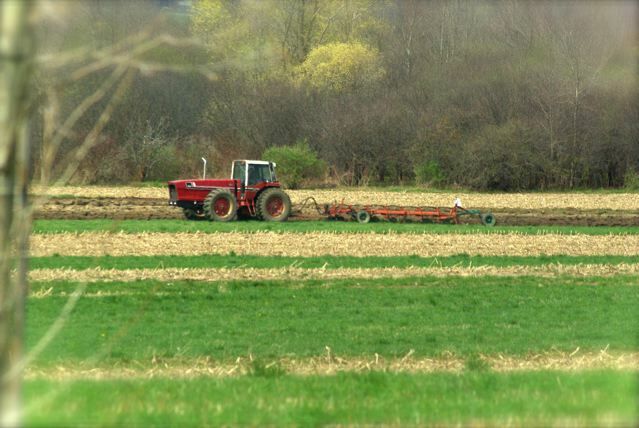 Just as we breathe a big sigh of relief and a prayer of thanks that the crops are finally in… albeit late, it’s time to cut hay, cultivate, mow as well as pack the trailer for my next show (Allentown Art Festival this weekend) and do three nights a week of lacrosse practices. 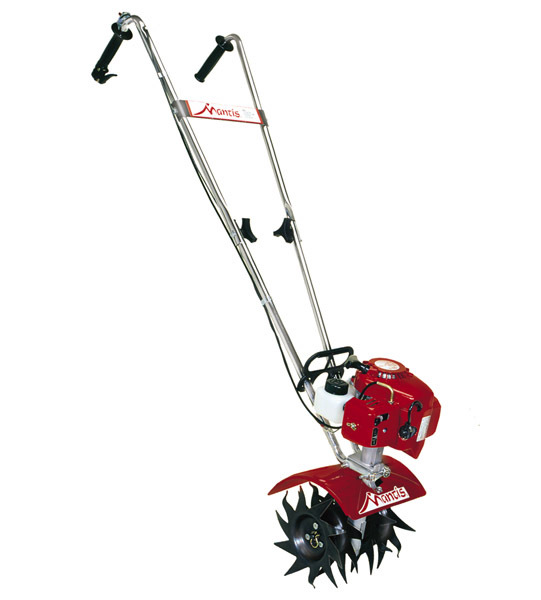 This year I decided to splurge and purchased one of those handy Mantis garden tillers for the vegetable garden. It is very light-weight and its narrow width works well in the small beds of my potager. 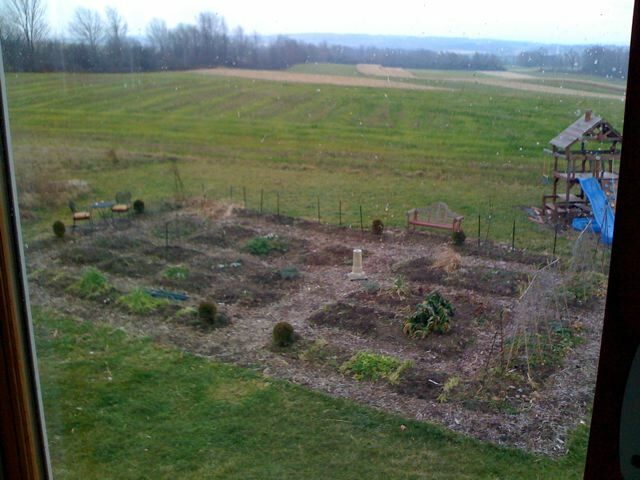 Speaking of which, the potager is almost completely planted… I’m thrilled! 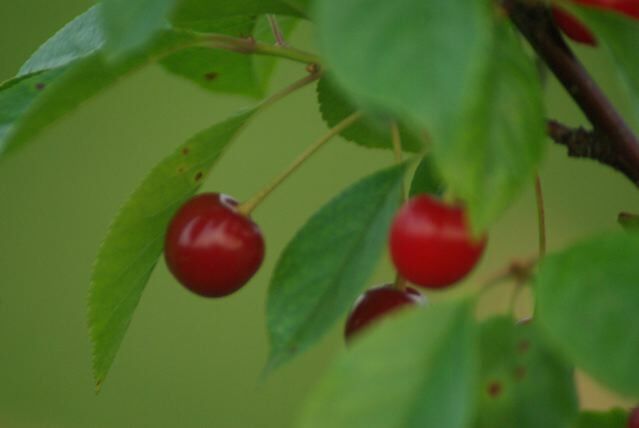 I think this year it will be a delight for the eyes and the tastebuds. 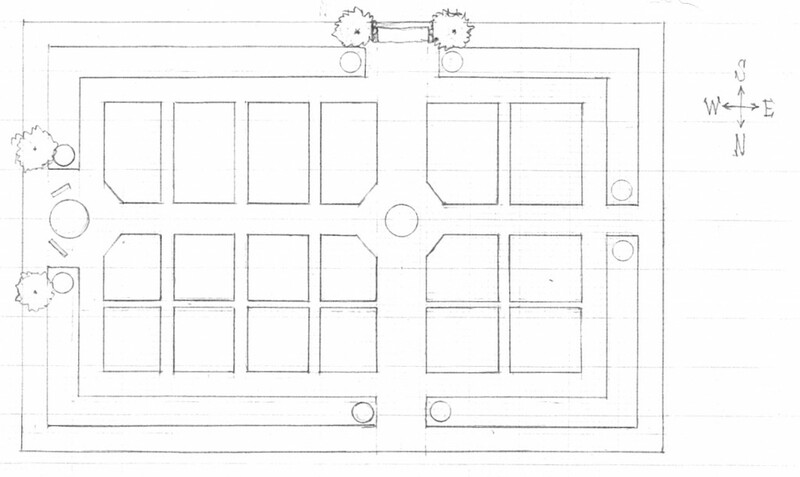 I always “plan” to put a “plan” on paper before I start planting… but I never do. It feels like painting when I am out there planting on the fly- thinking about lines, shape, color and repetition. At least this year I do have rows marked and I plan to do an “after” drawing of what is there for next year’s reference. I have threatened everyone that they will “rue the day” if they touch my plant markers as this is the first year that I am actually using them to keep track of which varieties grow/taste better than others. 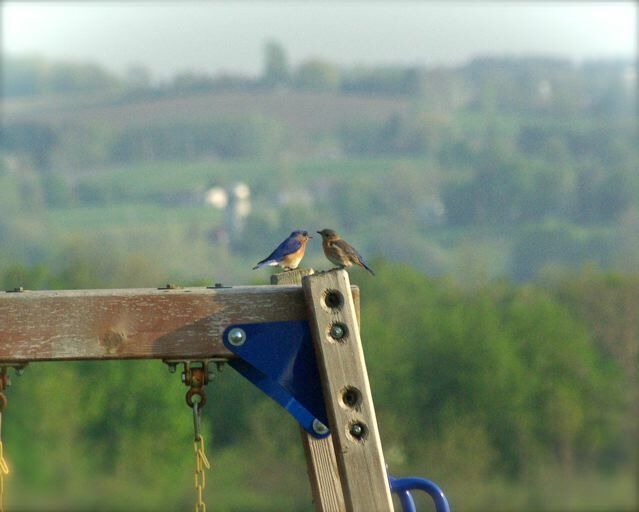 I’m thrilled this year to have an Eastern Bluebird family in a nesting box right under the studio windows on our rose arbor! It has been such a joy watching the coming and going of those busy parents. The male will come right out to the potager when I am there and perch on the pea trellises or tomato stakes. 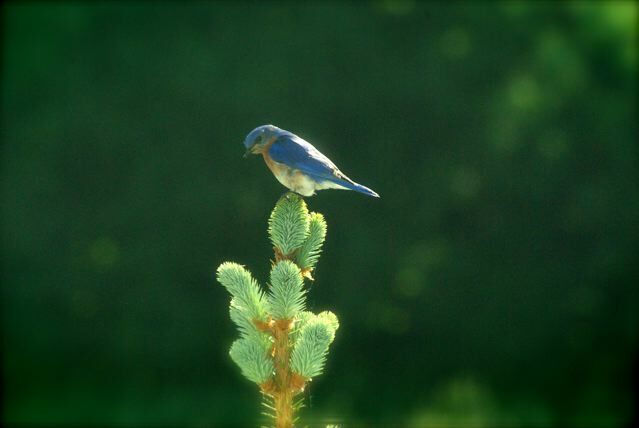 After years of never even seeing a glimpse of the elusive New York State Bird… its wonderful to have a family of them living here next to the garden. So friends, thanks for stopping by. I will soon be posting some recent paintings that I’ve been working on, a great list of vegetable gardening references, potager progress, and a fun French-themed dinner menu you will not want to miss. 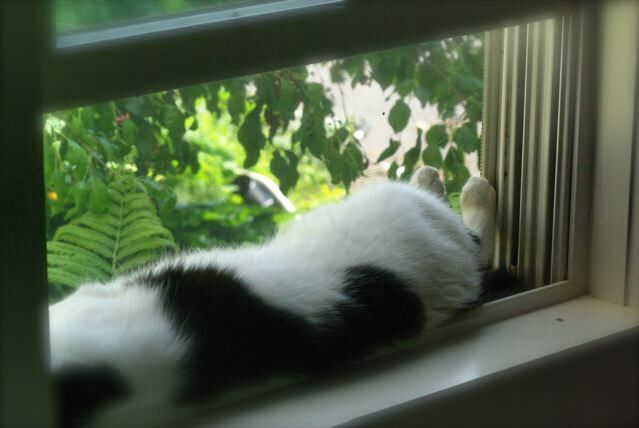 Now let’s all get to work on enjoying the upcoming LAZY days of summer as demonstrated by Pongo the cat. Pongo taking his afternoon nap. Are these guys the cutest things you have ever seen?! What personality in those little faces and bodies. 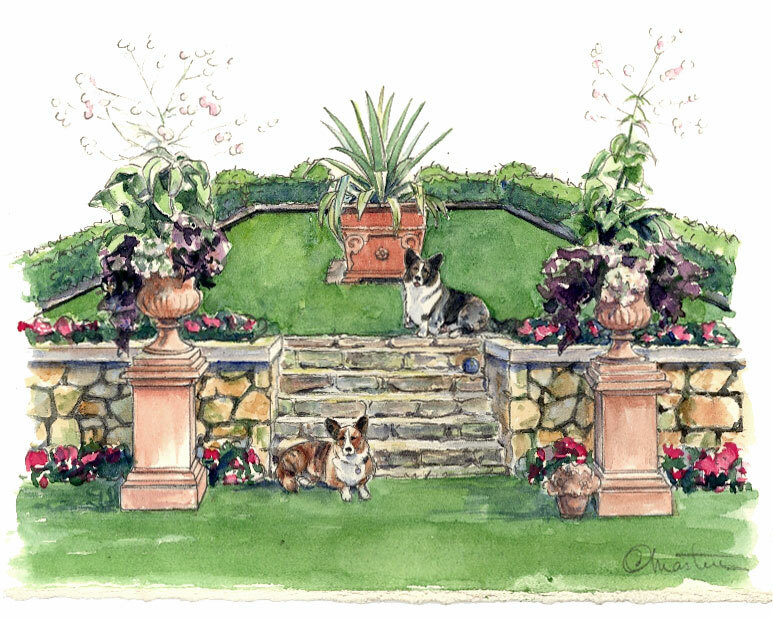 The lovely and talented landscape designer Deborah Silver from Detroit Garden Works contacted me regarding doing some custom work featuring her two little scamps. 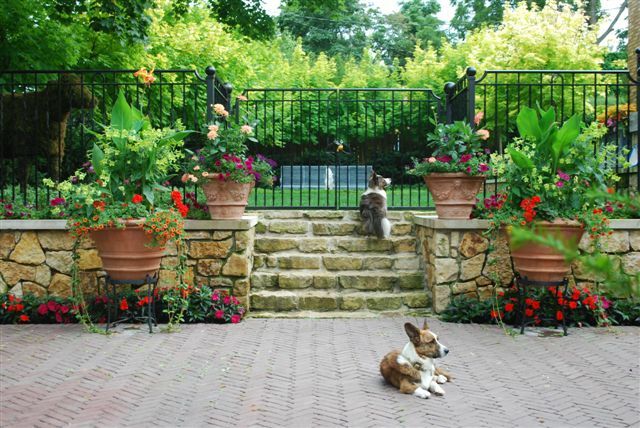 I went ga-ga over Deborah’s beautiful gardens, Italian pots and charming pups. I think my exact words were “Drool, drool”. Poetic, I know. Art is my gift, words… perhaps, are not. 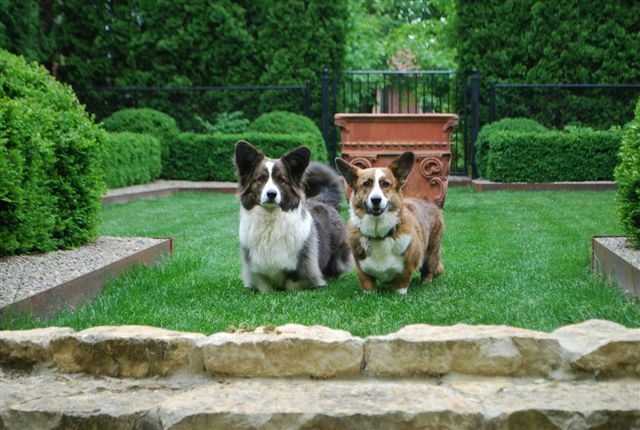 If you are in the Detroit area you should stop by Detroit Garden Works and meet the celebrities, Milo and Howard. I hear they are quite a hit. 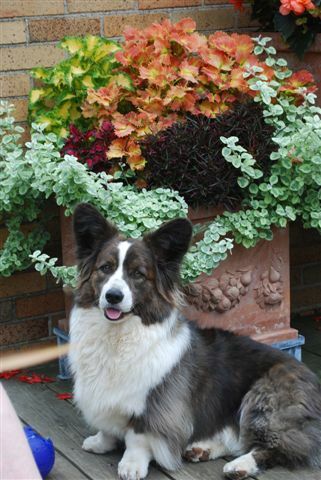 Customers often visit the store with their dogs… don’t you just love that! I wish I lived closer. They would totally have to kick me out at closing time. 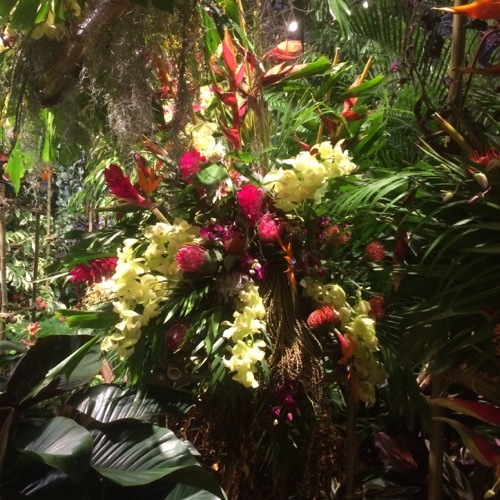 Be sure to visit Deborah’s blog Dirt Simple filled with lots of info and garden eye candy. 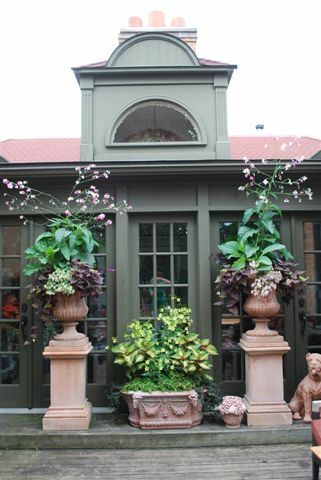 I loved the before and after Riverside landscape project and the Spring pots with pansies and lettuce. Great idea! The Corgi design will be soon be available in notecards, limited edition prints, limited edition pillows, linen towels, lavender sachets and linen cocktail napkins. 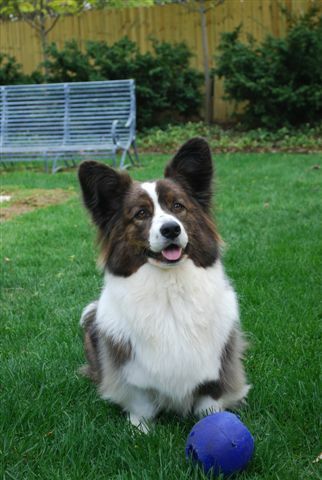 See pictures below for references of Deborah’s beautiful gardens and Corgis! I got alittle crazy and put it all together! Couldn’t help it. First, set a fairy trap. No, just kidding. That is impossible from what I’ve heard. 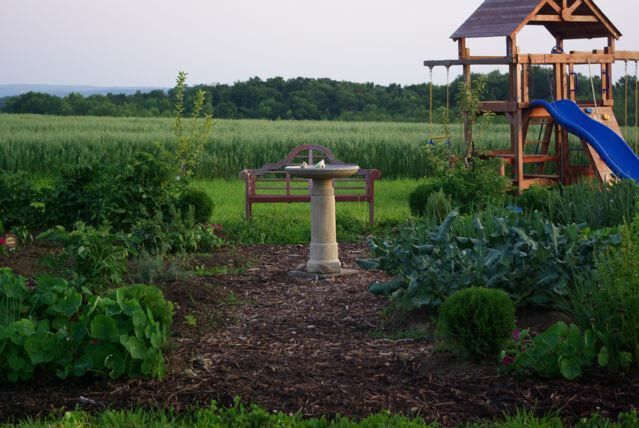 However, there are many ways to create a fairy garden. 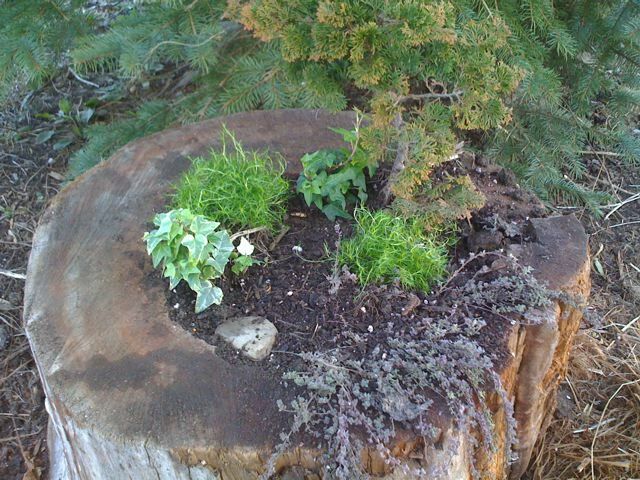 I was inspired to start one in an old tree stump after hearing a lecture on “Fairy Tales in the Garden” by blogging diva Amanda Thomsen of Hortmag.com’s Kiss My Aster. A timely lecture considering that it just so happened we had an old tree in the barnyard that was getting cut up for firewood. 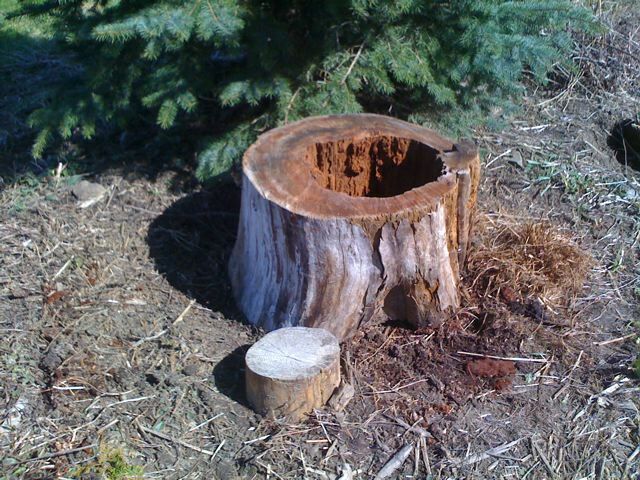 I found the perfect hollowed out stump complete with a fairy door in the bottom. Yay. After zipping over to the barn with the skidsteer and picking up the enchanted stump, I found a lovely spot with shade in the morning and late afternoon situated in front of a young blue spruce. 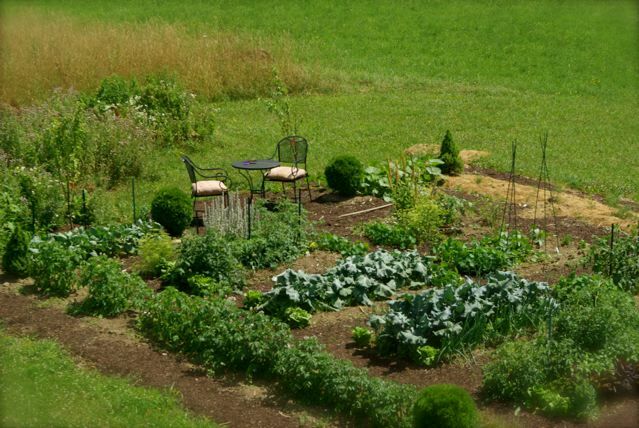 While I would love to have a sweet little wooded spot, we live on the top of a hill no mature trees. It could have gone in the nearby hedgerow but I wanted it close enough to see it daily and for LaLa to visit there often. Note the lovely little fairy door at the bottom. All it needs is a walkway, paint and a doorknob! 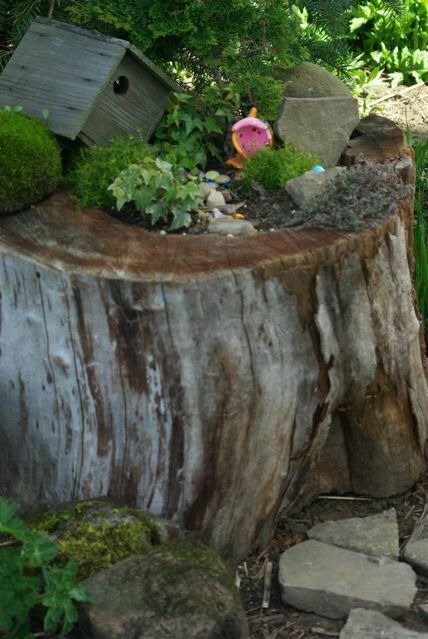 Planting the garden in a tree stump is nice because it raises up the viewing level and creates numerous places to introduce your fairy decor. Speaking of fairy decor… did you know that you can order anything that you can dream of online? I had no idea! I have my eye on a particular metal table and chairs after finding the sweetest tea set at a craft store. Stay tuned on that one. Varigated ivy, Irish moss, Hinoki cypress and creeping thyme. 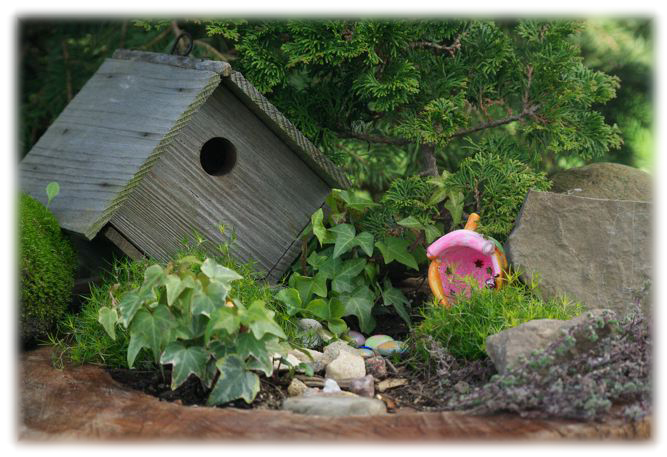 A fairy garden doesn’t haven’t to be expensive to make. I used a dwarf Hinoki cypress that had gotten stepped on a couple times in my perennial bed that needed a little TLC. 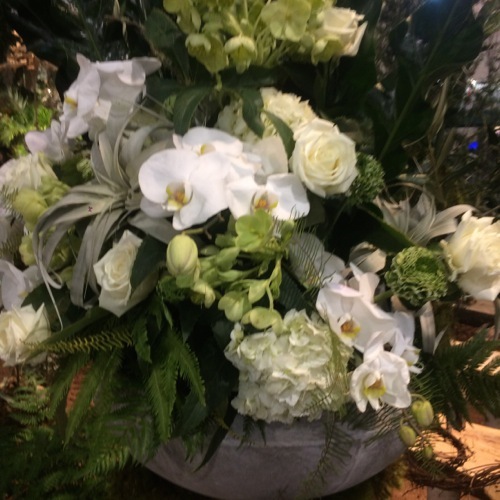 It made a nice small tree for the arrangement. We used a small little wren house for the fairy’s cottage with a cute little ceramic gazebo and mushrooms from a set that LaLa got for her birthday. 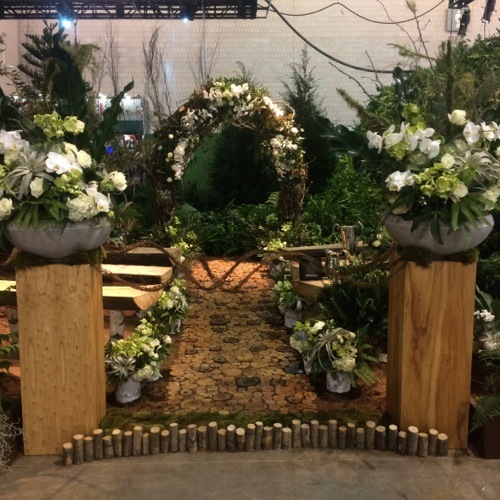 Once your little miniature outdoor landscaping project is planted start adding little accessories to bring it all together and enchant the fairies, your children and yourself. 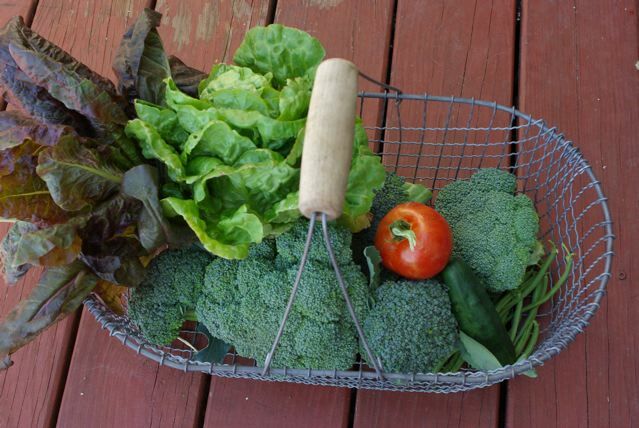 I found a charming little red wagon, some potted plants and a garden hose to add to my garden. I think the perfect little gardening fairy will come. I hope she will be willing to work for her keep! So what are you waiting for?! 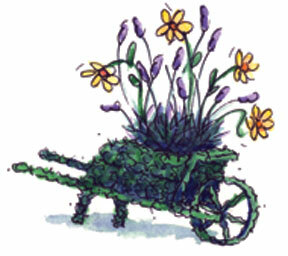 Start that fairy garden and enjoy it with wonderment as though seeing it through the eyes of a child. Mine is far from complete so stop back in and see how it evolves! 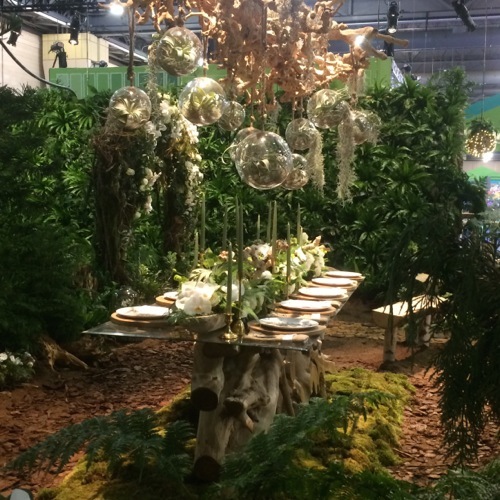 What would be featured in your fairy garden to make it uniquely yours? 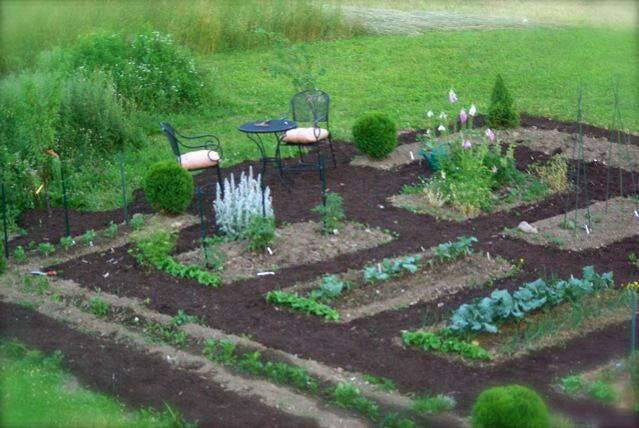 My vegetable garden expansion took place last spring. 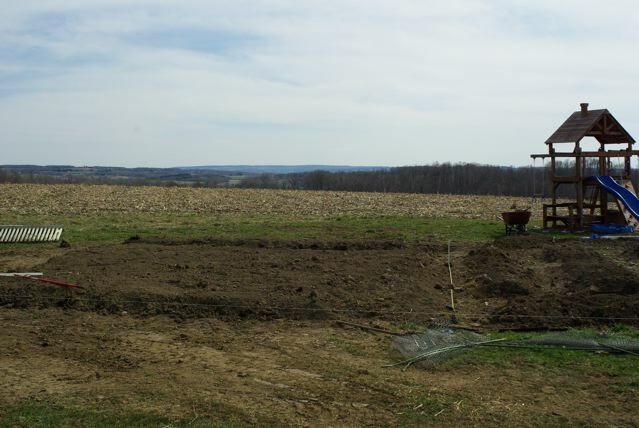 Farmboy was busy farming, the ground was workable and I had the skid steer! 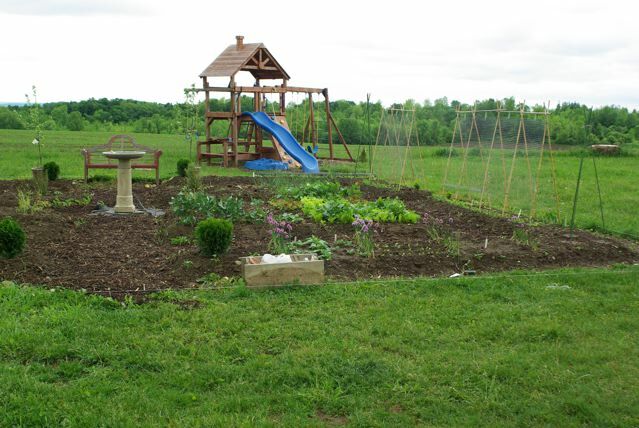 My exisiting vegetable garden was a series of 9 raised beds about 3 ft wide by 5 ft. long running north to south. My sister kindly pointed out that it looked like a graveyard. I’m not a rectangle with rows kind of gal. I need paths. A destination. 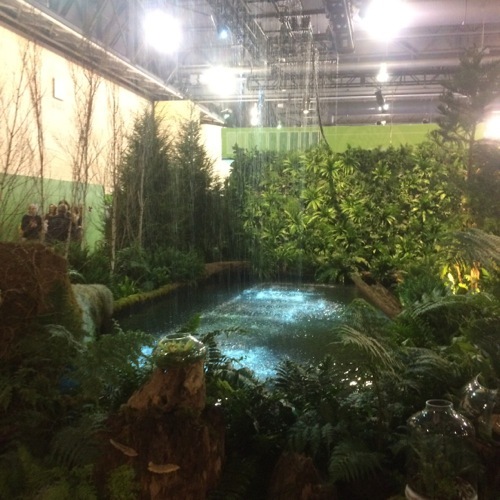 It needs to charm me, enchant me… maybe I just wanted a place for the kids to play without stepping all over everything. I needed paths. I digress. 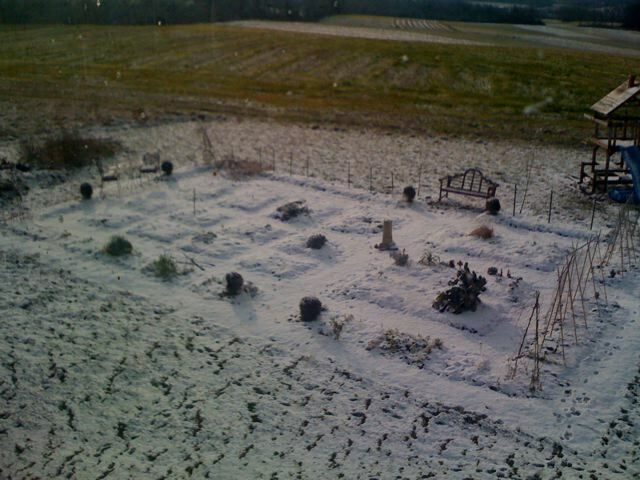 View of old garden raised beds (early spring). Note playset in background… picture two-story state of the art chicken condo in a couple of years. Don’t tell the kids. New area to the left. 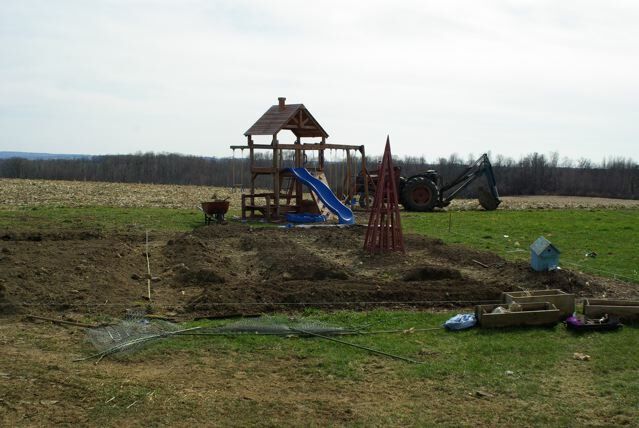 I started my expansion by layering composted horse manure from the barn and topsoil. Hmmm. If I had planned it on paper I wouldn’t have made a giant raised rectangle. It was supposed to be left until Fall but I COULD NOT leave it alone. 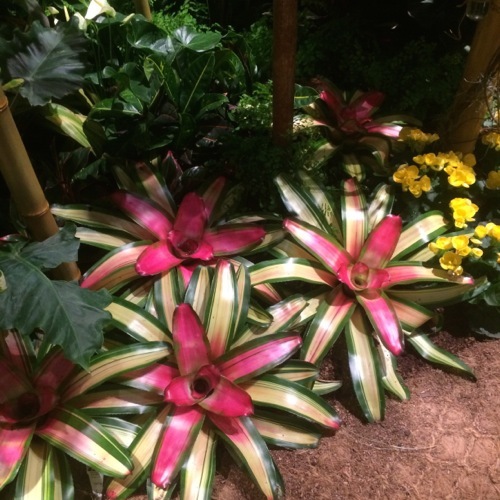 I had to see structure, shape, green plants… and paths. Out of that huge rectangle, I dug out my little paths. Ahhh. Structure. Geometry. A destination. I worked like a crazyperson. It had to be done. I couldn’t garden in half of that space and watch the weeds take over the other half. I added a bench to sit and rest from my path making madness. 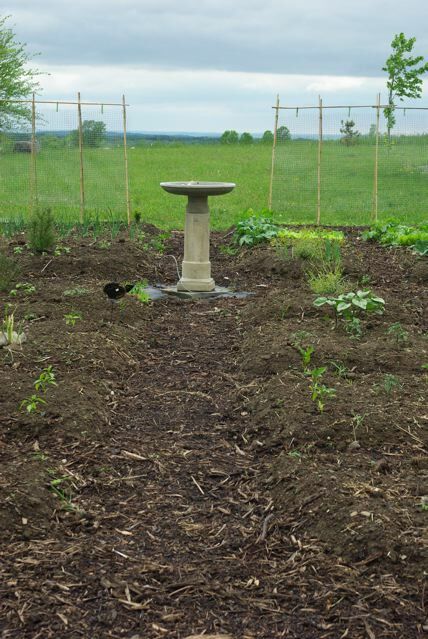 On Mother’s Day I was given a lovely birdbath/fountain to add as the focal point of my emerging potager. 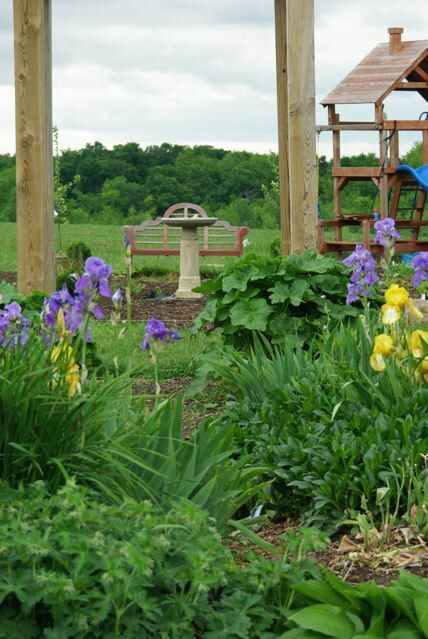 I added an apple tree to each side of the bench as well as Little Gem globe arborvite to mark the entrance and termination of the two main paths. 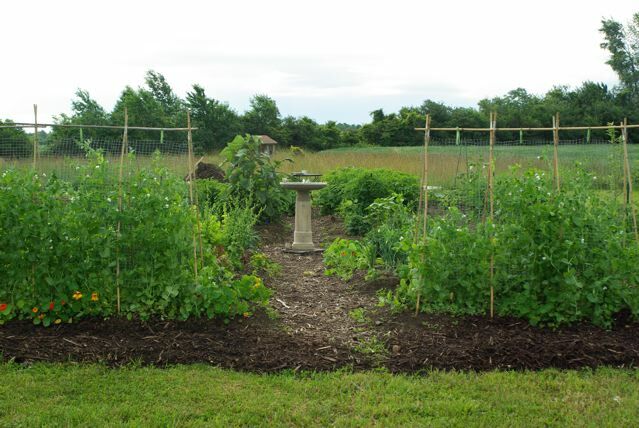 View to the west through the pea trellises. 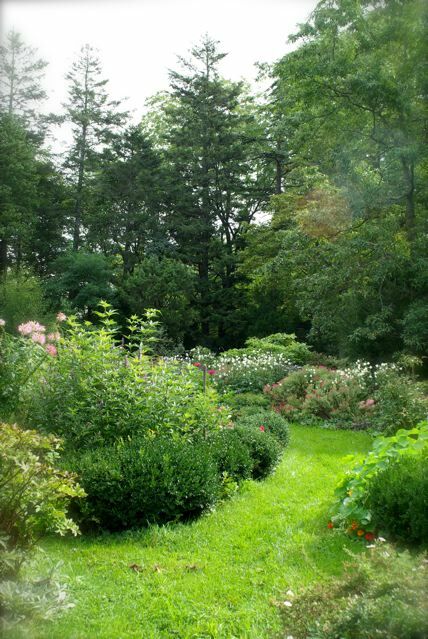 Once the paths were established I added landscape fabric and mulch to keep the weeds at bay. Along the raised edges I planted nasturtiums to keep the weeds down. They were very prolific and effective. Note to self: plant dwarf varieties next year. 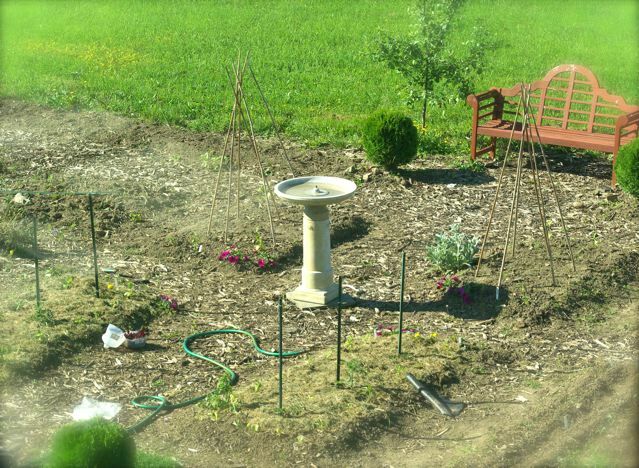 View through side perennial garden and arbor into the potager (towards south). View of potager (mid summer) from house. 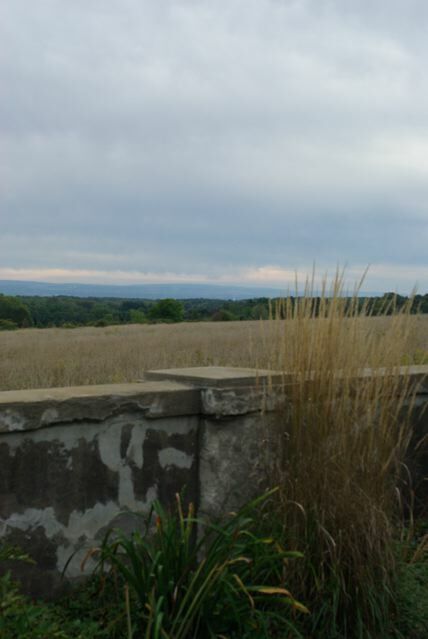 View to east through center axis. 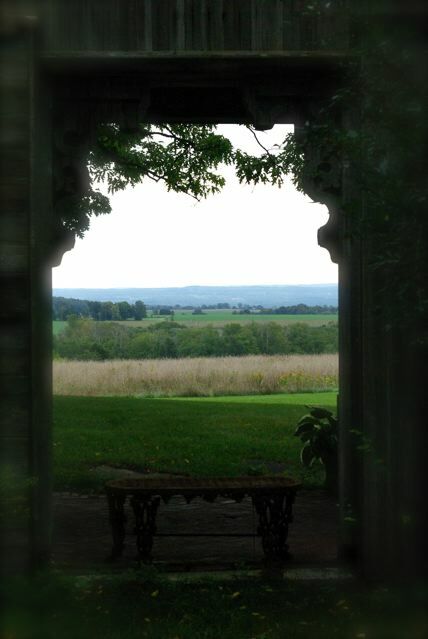 View to west from bistro set. 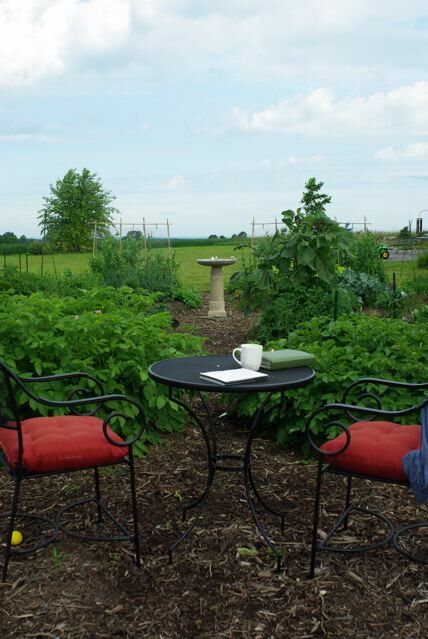 The bistro set was a welcome addition to the potager. La La and the Bean enjoyed breakfast out there on numerous occasions. 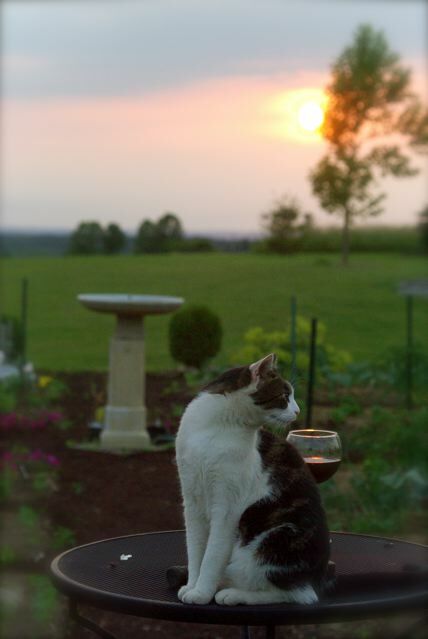 Junebug (my mom) and I contemplated life, gardening and much more while watching the sunset and having a glass of wine. LaLa often brought us appetizers of chives, broccoli, mint and fresh green peppers. Mid summer view to the south with oats in background. View from studio in late fall.